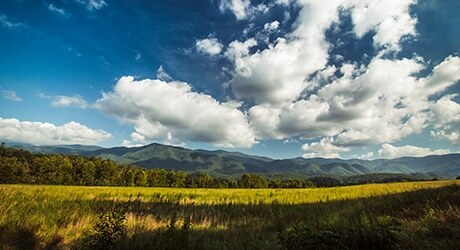 One of the most popular areas within the park resides in the Cades Cove district with the main attraction being the 11-mile one-way scenic loop. Usually, the scenic loop is open to drivers from sun up to sun down. The one lane road boasts a 20mph speed limit with several pull-offs and parking lots to stop and enjoy the surroundings. Traffic can be heavy during the summer months but is well worth it for wildlife viewing, historic churches, cabins, pastures, and gorgeous views of The Smoky Mountains. 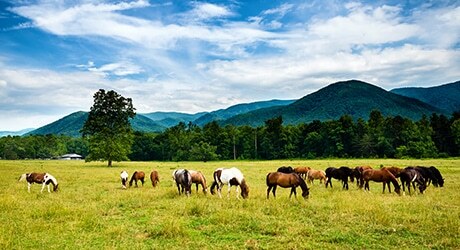 Pack a picnic for the ride and enjoy the experience that Cades Cove offers. Cades Cove Loop Road is located about 31 miles from Pigeon Forge. Take the parkway to traffic light #3 to Wears Valley Road. Take 321 to Townsend. Next, turn left onto highway 73 until you see the sign for Cades Cove. Turn right onto Laurel Creek Road.